This past weekend, my friend's Dana and Jon got married in Seattle. I made them a quilt as their wedding present. I looked at many existing quilt designs for inspiration, since a quilt for a wedding is somewhat of a tradition. Instead of tackling a traditional quilt like double rings, I made up my own pattern. I used Illustrator to create a patch that could be repeated and rotated to make an interesting design. Since I currently live in such a small town I ended up picking up fabrics whenever I went on trips so the materials were collected in New York and Portland, OR. 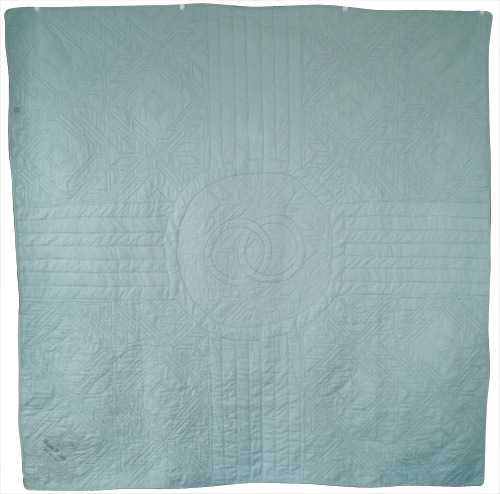 The quilt measures about 78" x 78" and is 100% cotton, including the batting. 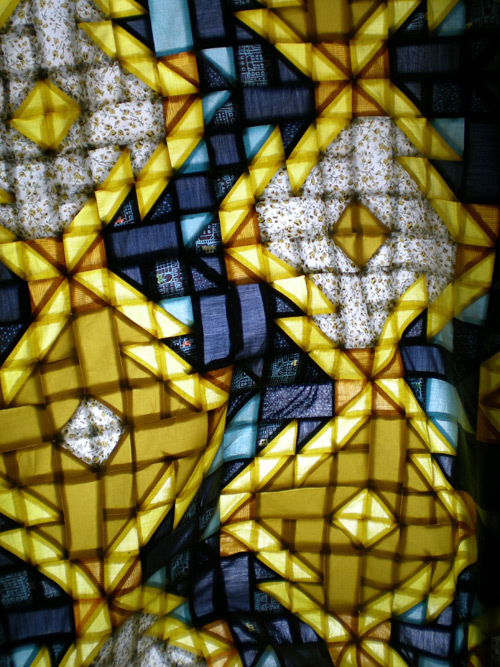 There are 2,400 individual pieces making up the full pattern and it took me 130 hours from start to finish. Color-wise I hadn't been to Dana's house in awhile so I wasn't sure what to pick. I did know she likes yellow so I made that the connecting color. 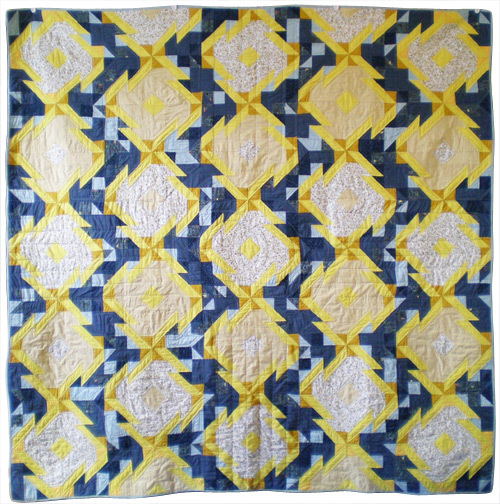 Since blue is a complementary color to yellow I chose a couple different patterns and shades to create the background. I incorporated a zia symbol into the quilting since Dana loves her Santa Fe hometown. The interconnected rings in the center are trying to really drive home the marriage part. Quilts too! I really enjoy this piece. I think the color combination is a good match. Seriously it's the most amazing thing I have ever received. We teared up when we opened it. And the pictures don't do it justice!